This afternoon I made some sweet Chinese steamed bun using the basic mantao recipe I have posted last time. This time I made it with some sweet fillings from mung bean paste mixed with sugar and coconut milk. There are some variety of the fillings, another kind is shredded coconut with palm sugar. Recipe for the bun you can find it HERE. 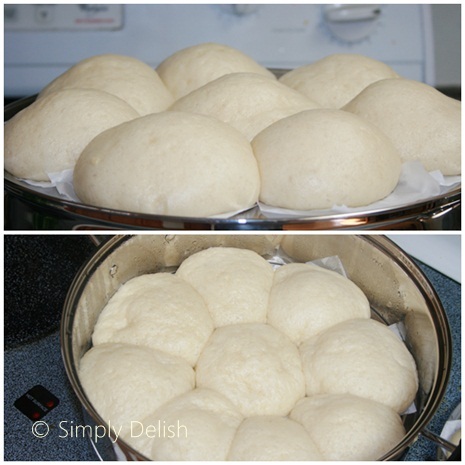 After the dough is ready, I did not fold the bun but instead I cut it evenly into 18 to 20 pieces. Drain the beans and steam it until cook, then let it cool. Process the beans together with sugar and coconut milk, you can add or reduce the coconut milk until the bean comes to the right consistency, you do not want the paste to be too mushy or too dry. Set aside, ready to use. 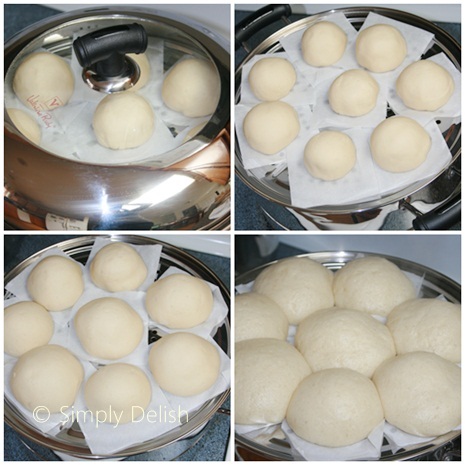 Take one peace of the dough, flatten it with your hand and scoop enough filling, then cover it neatly with the dough. Place it on the parchment paper. Fill the steamer with warm water, lay all the ready bus and let it raise for 45 minutes to 1 hour. Turn the stove on once all the bus are raising, cook until done.